In descriptions of Roman sacrificial rites, five different terms for designating the altars are commonly used : focus, foculus, mensa, ara and altaria. Of these, the last two appear most frequently, and ara appears to be a more ancient term. They are the common designations for any place of offering, without regard to the use of fire in the ritual. Below: A Roman military tribune (centre). Note the horse-hair plume on the helmet, the cuirass, mantle, sash indicating knightly rank, and pteruges. ​The Bridgeness Slab shows a Legionary Commander pouring a libation offering on an altar. This ceremony occurred at the start or conclusion of a campaign or enterprise. "Soldiers were required to participate in a number of official Roman religious rites held by their regiment at regular times in the year. These included religious parades in honour of the most important Roman gods, especially Jupiter, the supreme god of the Roman pantheon: many altars are headed with the letters IOM (Iovi Optimo Maximo: "to Jupiter the Best and Greatest"); Mars, the god of war; and Minerva, as that goddess is also associated with war. These parades were accompanied by animal sacrifices and feasting. Another important regimental cult was emperor-worship. Parades were held on imperial birthdays, when the imagines of the ruling emperor and of deified previous emperors would be saluted and offered sacrifices by the prefect of the regiment." ​"Soldiers were only permitted to honour such non-Roman gods as had been officially approved by the collegium pontificum ("Board of High Priests") in Rome, which regulated the state religion. The board would assess whether a foreign cult was acceptable. If, a non-Roman god was officially annexed to a Roman god on the basis of shared characteristics[ e.g. Mars Toutates, the assimilation of a Gallic deity to the Roman god of war. In practice, off-duty soldiers were allowed to follow whatever cults they pleased, providing they were not specifically prohibited." One of the Military altars unearthed in Maryport, the site of a Roman fort in Cumbria. 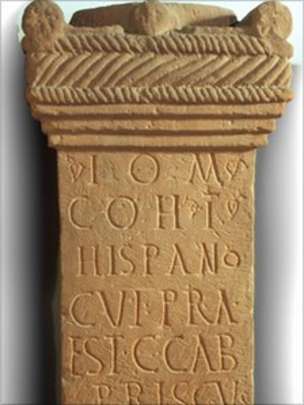 Dated to the 2nd or 3rd Century AD, it was inscribed on behalf of Titus Attius Tutor, commander of the First Cohort of Baetasian, which came to Maryport from what is now the Netherlands. ​The place where the 17 altars were found now forms part of the Roman Maryport site at Camp Farm, which is owned by Hadrian's Wall Heritage, England, UK. Photo Senhouse Museum. Altar images below photos by www.KornbluthPhoto.com for educational use. ​Right: Military Altar dedicated to the Discipline of the Emperor, set up by the Second Cohort of Tungrians. ​Altar from Birrens, in Dumfriesshire, now in the National Museum of Scotland. 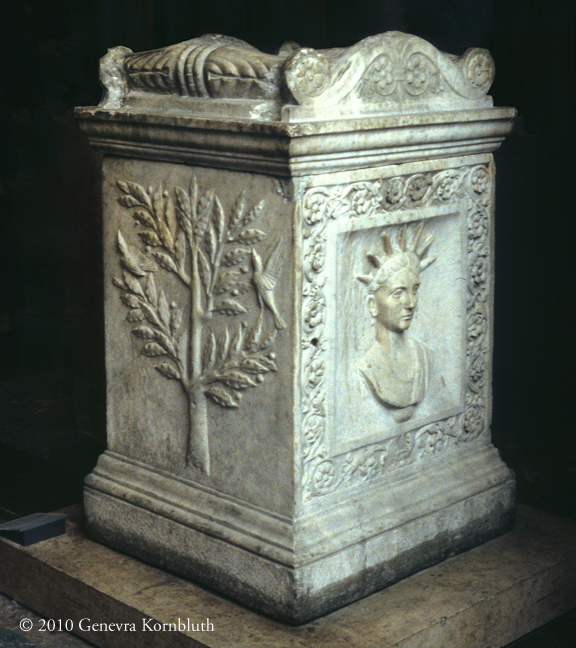 Found in 1696 the Funerary altar of Gnaeus Sentius Felix, an influential man in Roman society in Ostia, who lived in the end of first century and begining of 2nd century AD.hF Palazzo del Rosso. It has finally arrived at the Galery in the 18th century. For a more personal approach to Roman Religion see ​Nova Roma, Religio Romana site on "How to start practicing private rites" by Pontifex Maximus Marcus Cassius Iulianus.